Bass-heavy, rhythm section-driven rock 'n' roll with a garage bent, all played with punk spirit. 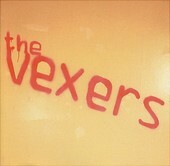 The Vexers' self-titled full-length is a loud, danceable shout out to the current garage-rock trend while also staying true to their own style, which separates them from the masses of garage-rock bands coming out of the woodwork these days. With a female lead singer, the band is able to add a slight drop of sweetness to the jagged edges and scream-sing offerings of the band. Void of any melody, but making up for it with full speed ahead guitars and loose, fitting performances, the sloppy rock 'n' roll offerings of The Vexers sounds real and alive, embodying rock 'n' roll to a tee. I'll give it a B.